I usually avoid really popular patterns. I'm not exactly one to keep on top of the most popular patterns on Ravelry, and if something becomes really, really hot, my inclination is to avoid it like the plague. 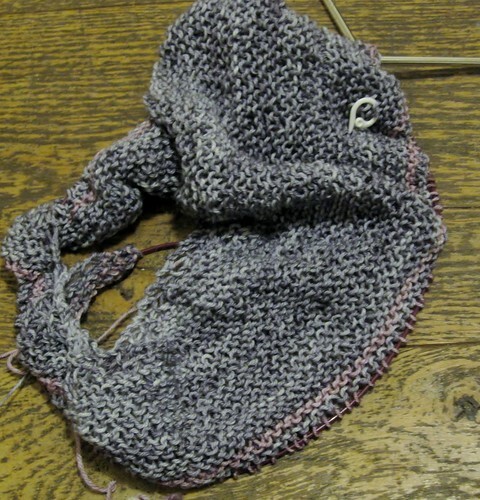 I'm just not that in to knitting something that everyone else is doing. In other words, I'm contrary and don't like bandwagons. The thing is, sometimes those really, really popular patterns? They're popular for a reason. And everyone's knitting them for a reason. A really good reason. Cue Color Affection by Veera Valimaki. I first saw this shawl on the Yarn Harlot's blog at the beginning of the summer. Then they were everywhere. People were spending endless hours debating about color combinations, then vendors were selling pre-chosen sets so people didn't have to agonize over color choices (there are reasons why it takes a special kind of crazy to design Fair Isle sweaters...), and my general reaction was meh. I like garter stitch alot, and I can get behind stripes in certain circumstances, but I still wasn't on board with this pattern. and I cast on my own Color Infection. Things did not go swimmingly at first, as I forgot the trick of doing a YO between the first two stitches of every row to ease the edging a bit. I ripped back most of section 1 to fix that. I'm now 7 repeats into section 2 and looking forward to adding in "Only When Invited" for section 3. 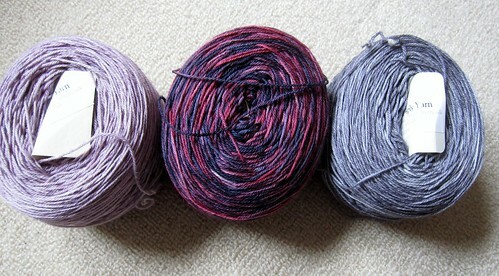 And I'm plotting the colors for my next one, of course...because this pattern is contagious. Written by porpoise On October 30, 2012 In "scarves"